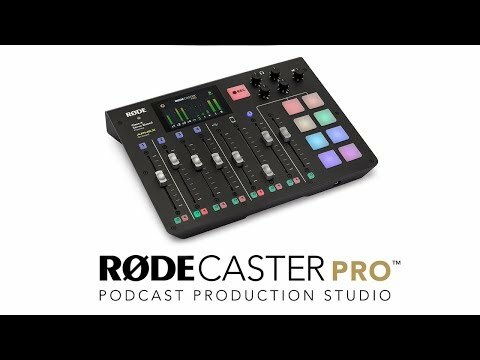 Product Overview The RØDECaster™ Pro is the world’s first fully integrated podcast production studio. Whether you are just starting out, or are a seasoned broadcast professional, the RØDECaster Pro Podcast Production Studio is all you will ever need. Have a remote guest you want to interview? Simply connect your phone to the RØDECaster Pro via Bluetooth™ or with a TRRS cable. The RØDECaster Pro automatically provides “mix-minus” audio to prevent echo being heard by the caller, without the need to purchase dedicated and costly hardware. Telephone interviews with remote guest never sounded so good! The RØDECaster Pro operates as a standalone unit straight out of the box, recording direct to a microSD™ card. You can be up and running in minutes. The RØDECaster Pro can also connect to your computer via USB, as it is a USB audio interface. This means you can record your podcast to your favourite recording software.